Ok, it’s been a few day since Blizcon ended and all the announcements were made. People asked a lot of questions and got some answers and have been chewing on them ever since. What I’m going to do here is sum up some of those discussions and link to the originals. Also see our other posts: The level 100 talents and a Warlords overview. 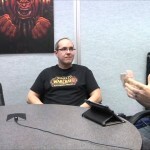 There’s the Ausgamer’s interview (just below,) another by RockPaperShotgun, and a video interview by Blizzpro. Enjoy.